The device comes with a 1000W motor meaning it will be able to process through any kind of substance you want, regardless of how tough it may be. It also comes equipped with a 4.3-litre mixing bowl that will provide you plenty of room even when it comes to some of the most sizeable meals. 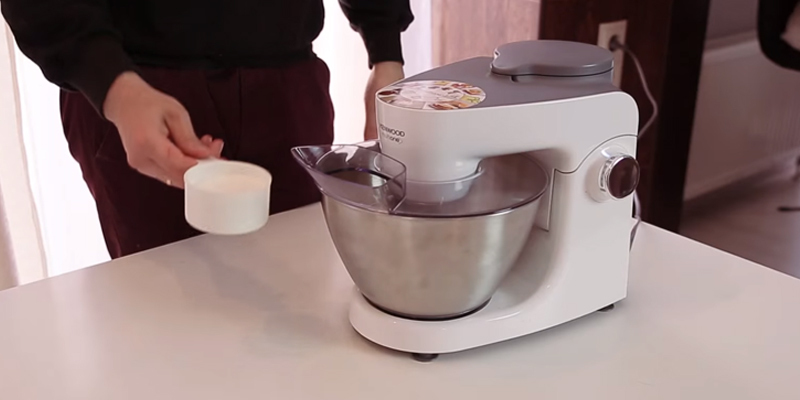 The model is a bit larger than what you might expect from a regular stand mixer. Arguably the best stand mixer for all of your baking and food preparation needs. 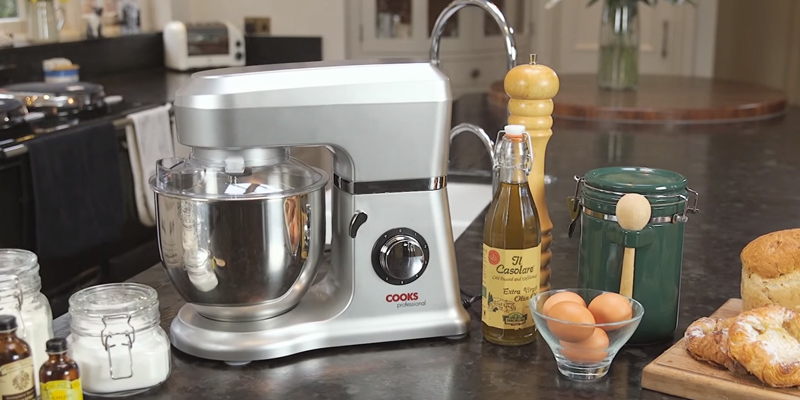 It doesn't necessarily excel in all of the areas but if what you're looking for is one of the most versatile and powerful stand mixers on the market, we can wholeheartedly advise you to go with the Kenwood KHH326WH MultiOne. 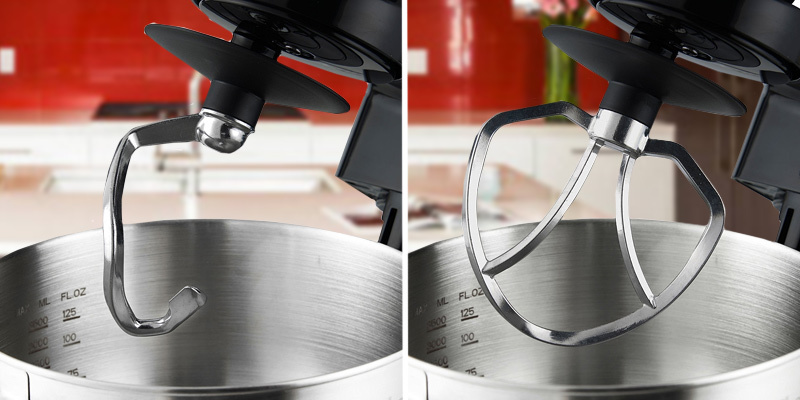 The tilt-head structure ensures that removing the mixing bowl is always going to be straightforward and simple. 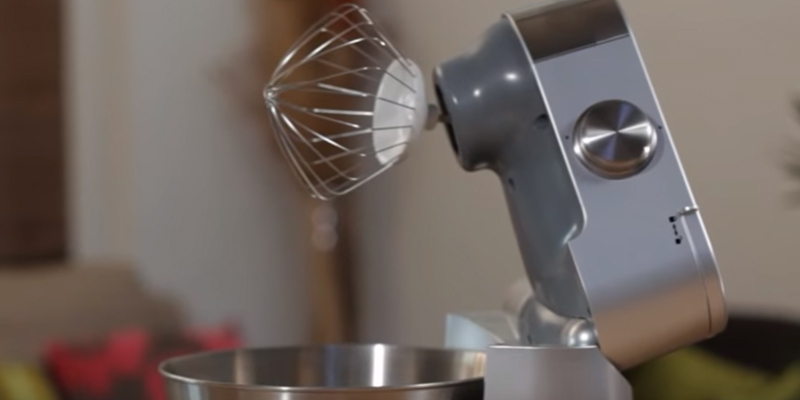 The stand mixer additionally comes with a safety switch to prevent accidental starts if the appliance happens to be located in an incorrect position. It also includes 3 easy fit attachments making the process of preparing any kind of food simple and convenient. Splash guard entrance features a narrow passage making it harder to load ingredients. Instead of wasting your time and money on the company that has no idea what it is doing, invest into the VonShef 13/322 Food Stand Mixer and experience the result of competence and expertise that one might expect only from the professionals of this field. 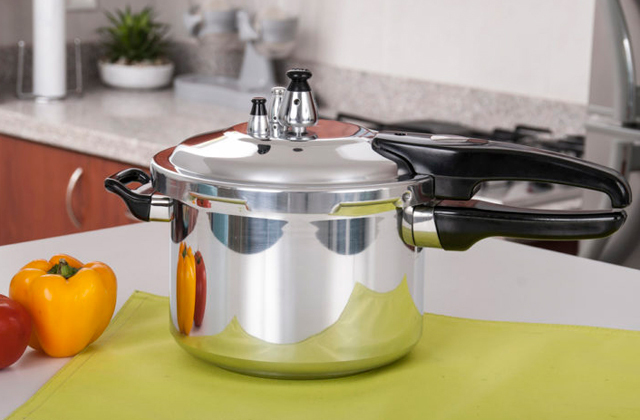 Aside from the volume, the stainless steel bowl comes with a couple of small handles that make it a whole lot easier to lift it up and carry from one place to the other. Using the flat beater, you'll be able to work with heavy mixtures like cakes, biscuits, and all kinds of pastry. The silver glossy finish makes the mixer look rather sleek and stylish. The power cable is relatively short. 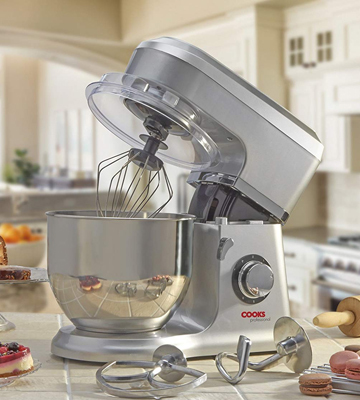 The Cooks Professional D9269 Electric Food Stand Mixer will prove to be a particularly useful kitchen appliance. 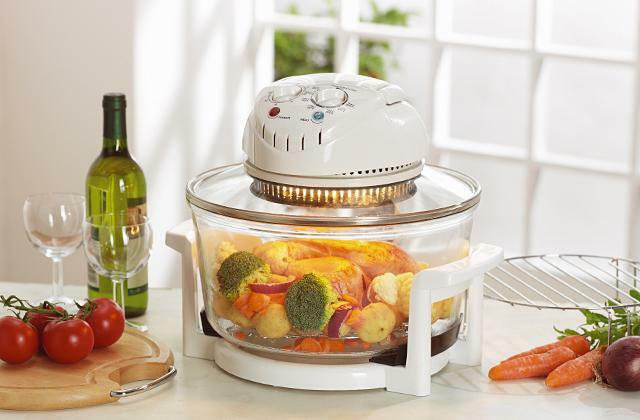 With its help, you will be able to prepare a considerable number of delicious, homemade foods. Though quite versatile, the model is particularly suitable when it comes to fluffy meringues, bread dough, and cake mix. 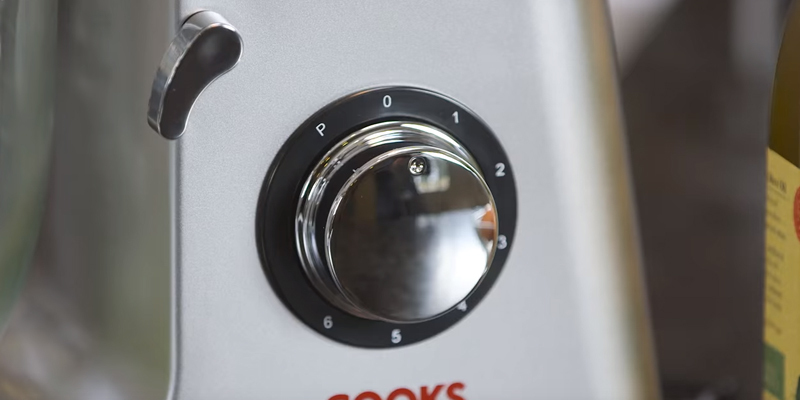 The Andrew James Food Stand Mixer comes equipped with six powerful speed settings that will provide you the opportunity to mix a considerable variety of ingredients with convenience and ease. The pulse function that also comes with the device will allow you to blitz through tougher mixes such as bread dough and meringue. The bowl may seem a bit heavy to some customers. The Andrew James Food Stand Mixer does not trail behind when it comes to power and speed but what makes this appliance such an alluring option is the convenience of use and a comfortable design that ensures that operating the device is going to be a piece of cake. With 31.3 x 24.3 x 29.2 cm in overall dimensions and less than 4.5 kilos of weight, this is one of the more portable mixers out there and you should be able to find some space for it whether you live in a compact studio apartment or an adequately-sized house with lots of different pieces of cookware. 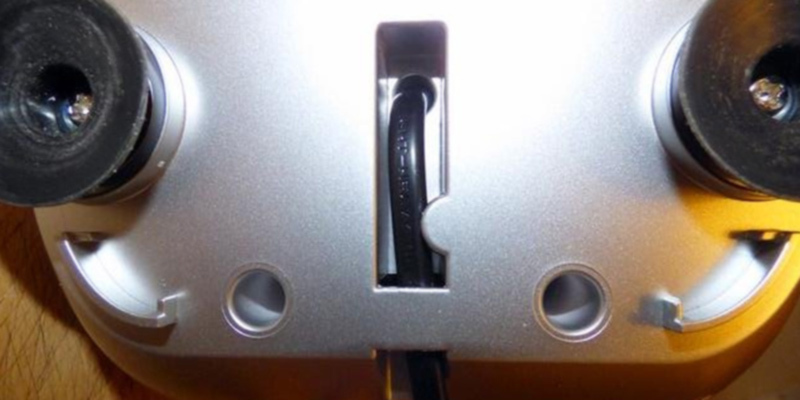 The plastic housing is prone to scratches. The KM240 is one of those stand mixers that is defined by two of its elements. First, there's the compact design that makes it a great option for people with a limited amount of space. Second, there's the simple and convenient operation that makes the appliance a particularly suitable choice for inexperienced users. With all of the advancements in the world of technologies that seemingly tend to infiltrate every single aspect of our life, it can often become confusing what kind of device you actually need. Look at the kitchen appliances, for example. 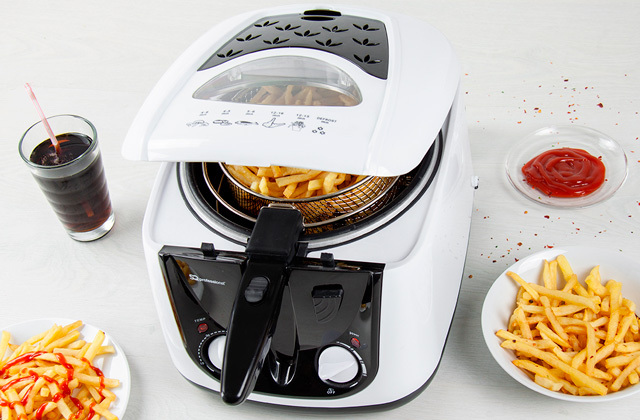 You have your air fryers that can be used if you wish to prepare some healthy snacks without using an abundance of oil, your barbecue grills if you're the kind of person that likes to have an occasional juicy piece of meat in addition to his everyday diet, or your braziers that are seemingly suitable for the same function as a barbecue grill but tend to be used more outside of the comforts of your house. 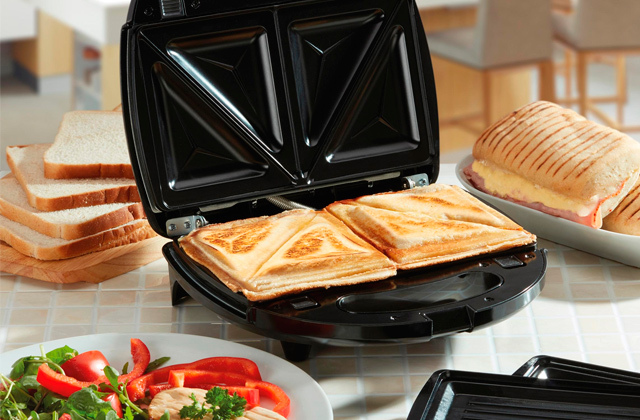 You can get a bachelor griller (also known as a mini kitchen or a mini oven) if you're the type of person that lives on his own and do not wish to bother yourself with preparing some of the more complicated meals. 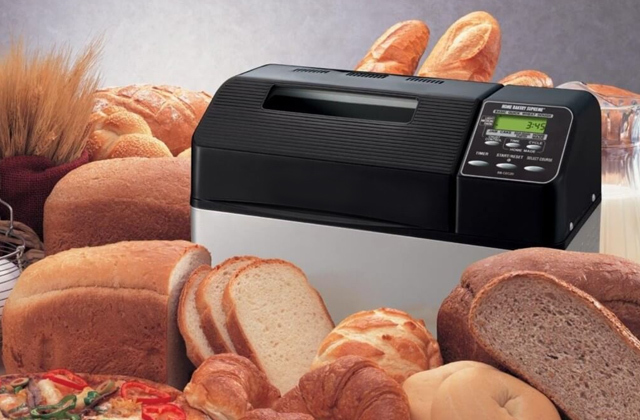 There also different types of bread machines for those people that like to have a fresh piece of homemade bread every once in a while and an espresso machine if you're the kind of person that cannot imagine starting his day without a cup of freshly brewed coffee. This kind of diversity when it comes to kitchen appliances is great, of course, since it provides everyone with an opportunity to prepare and enjoy their favourite food with some additional convenience. But as we have previously mentioned, it can easily confuse anybody over what kind of appliance is necessary and which one is more of a luxury. Of course, it all boils down to your personal opinion and your preferences, but if you ask us, you can never go wrong with a stand mixer. Whether you're a fan of cooking that likes to prepare different kinds of meals for himself and his family or you're the kind of person that thinks of food as more of a necessity, a stand mixer will be able to accompany you regardless of your preferences. So, if we have managed to successfully convince you to buy this particular kitchen appliance, you're unlikely to be disappointed with the Kenwood KHH326WH. People behind the Kenwood KHH326WH MultiOne stand mixer advertise it as an all in solution for all of your baking and food preparation needs. And as grandiose as it may sound, they're not necessarily wrong. 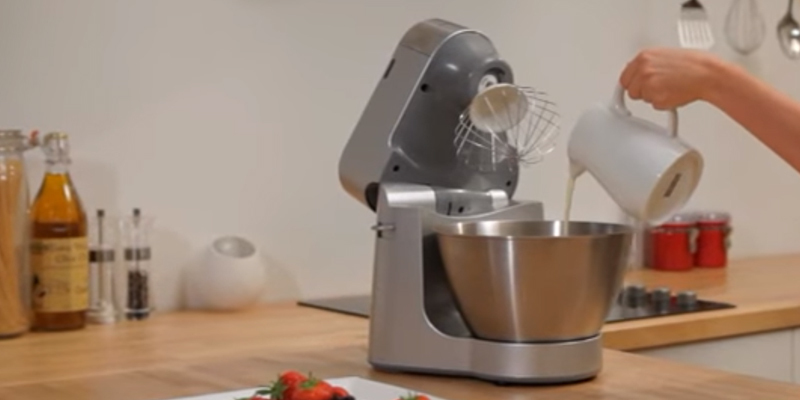 This kitchen appliance comes with a 360-degree Planetary Mixing Action that will allow you to whisk, beat and mix virtually any edible substance of your choosing in order to prepare delicious desserts and treats. You can use the 1.2 L glass blender to whizz up delicious and filling smoothies, iced drinks and hearty soups. You also have the option to employ the services of the citrus press and centrifugal juices if you wish to have some natural and nutritious juices in the morning or at any time of your choosing. Last but not least, this model is equipped with a Food Process Function that comes with some high-quality chopping blades as well as three slicing and grating discs for all your food preparation needs. Of course, as important as all of these functions may be, at the end of the day you would like to know what kind of a device you're getting in terms of all the other aspects, be it the size, the design and the power that makes the magic happen. 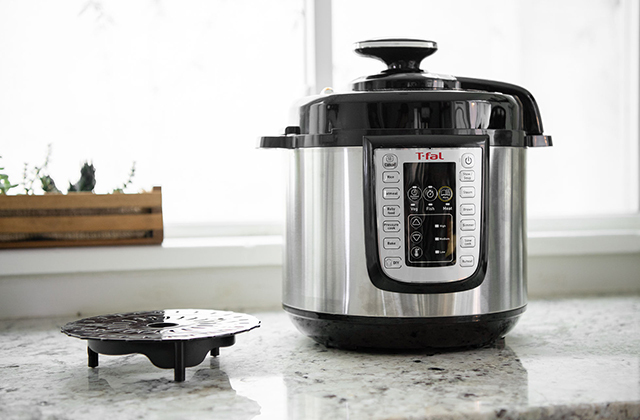 And when it comes to the latter one, this kitchen appliance is no slouch, to say the least. The device comes with a 1000W motor meaning it will be able to process through any kind of substance you want, regardless of how tough it may be. It also comes equipped with a 4.3-litre mixing bowl that will provide you plenty of room even when it comes to some of the most sizeable meals. It may not be the most compact solution with 40 x 24.7 x 29 centimetres in overall dimensions and over 5 kilograms of weight but that is to be expected from a model that features this kind of power. The body material of the device is plastic but the bowl is made up of brushed stainless steel so you don't have to worry about its durability. 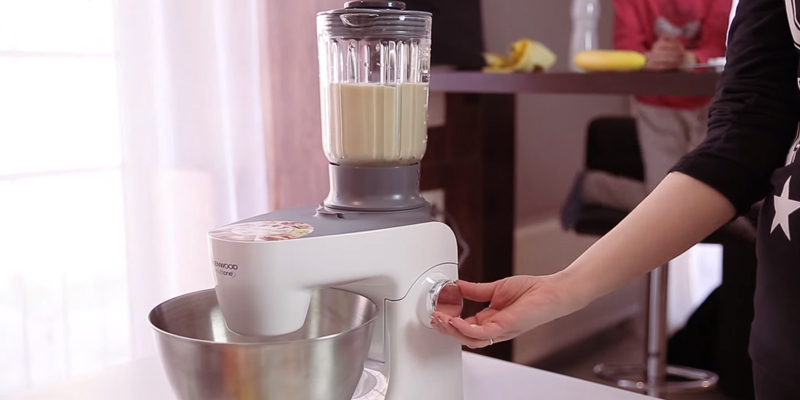 It also goes without saying that you don't just get a stand mixer but a solid package that contains 3 bowl tools, a dough hook, a whisk, a K-beater as well as a plethora of different juicers, blenders, grinders, including a splash guard and three disks for thin, thick and rasping slicing. 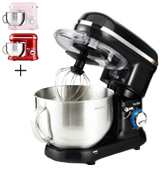 So if you're looking for one of the most versatile and powerful stand mixers on the market, you can absolutely not go wrong with the Kenwood KHH326WH MultiOne. Buying a new product in the area where you do not possess the necessary knowledge required in order to arrive at a thoughtful and well-informed decision by yourself can be tricky and often downright petrifying. It goes without saying that you have no idea what kind of aspects to look for when it comes to performance, what constitutes a convenient and a practical design of the model and what kind of price range you should be considering. So in order to avoid all of this hassle, some people tend to simply choose the company that is the biggest brand when it comes to this specific area or, even more commonly, the brand that they're familiar with from some of the other products that they may have owned in the past or are you using right now. And, generally, there's nothing necessarily wrong with that since the majority of those companies tend to earn the trust of millions of customers or a specific one by developing and manufacturing some of the best products when it comes to quality. But the problem with this approach is that the models from these companies tend to be more expensive and they may overlook some important features since their specialists may not possess the necessary knowledge in this particular area. While it may be a risky choice, sometimes the best decision is to look for the company that isn't especially known outside of this specific field but possesses the knowledge and expertise that you may be hard-pressed to find in a product with a bigger brand behind it. Naturally, searching for this kind of company by yourself can be hard. Fortunately, we did that job for you and the VonShef 13/322 Food Stand Mixer is exactly the kind of product you should be interested in if you're looking for some of that expertise. The VonShef 13/322 Food Stand Mixer is a model that comes with 3 easy fit attachments making the process of preparing any kind of food simple and convenient. The Flat Beater is your choice for everyday baking and mixing since this paddle shaped beater will combine batters, creams, cake mixtures and lighter doughs without facing or presenting any kind of difficulty. Whether you’re mixing, beating, folding or combing, you can rest assured knowing that this beater is not planning on missing a beat. Dough Hook should be your when it comes to some of the heavier mixtures such as bread and short pastry. Using this attachment, you can be sure that all of the unnecessary time and effort is not going to be wasted on kneading. Last but not least, there is a Balloon Whisk, an attachment that is perfectly crafted and appropriately suited to whipping up light and airy mixtures such as meringues and sponge mixes, making it an exceptional choice when it comes to light whisking and mixing. Regardless of what kind of substance you're facing, this kitchen appliance will be able to handle it ease. One of the more interesting aspects of this model is the size of the bowl. Whether you’re mixing cupcakes or cakes, the large 5.5L mixing bowl will be more than enough to provide the required space for all of your ingredients. 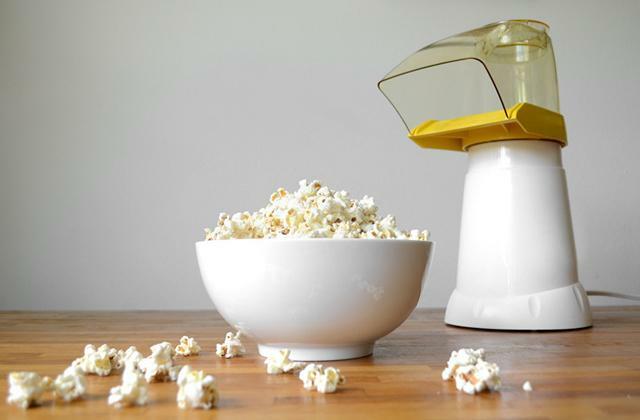 The bowl additionally comes with an integrated handle, making it easy to lift the bowl itself, pour and move the ingredients around the kitchen. And if that isn't enough for you, the company behind this product decided to sweeten the deal by allowing you to forgo your measuring jug and utilise the graduation measurements on the inside of the bowl. Of course, some people may be using American recipes instead of the UK ones. But there's no need to worry about converting liquid ingredients since VonShef put that into consideration before developing this product and the graduation measurements come using both metric and imperial measurement system. One also should not overlook how incredibly secure and polished the design of this model is. The tilt-head structure ensures that removing the mixing bowl is always going to be straightforward and simple. 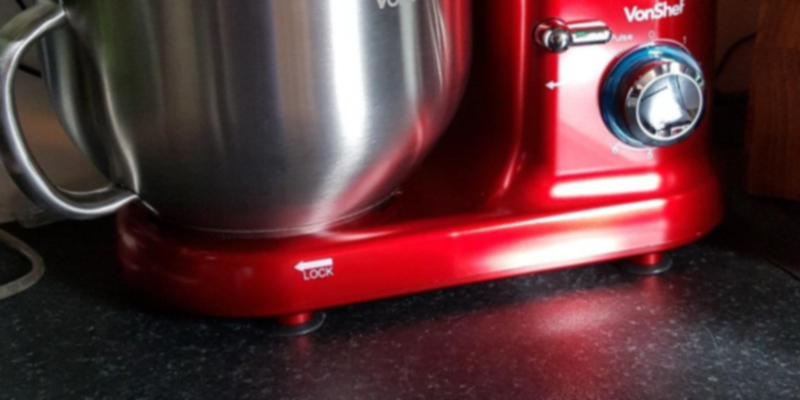 The stand mixer additionally comes with a safety switch to prevent accidental starts if the appliance happens to be located in an incorrect position. And if you'd like a cherry on top of this proverbial cake, the mixer’s compact and retro design in a glossy black finish will look great on any kitchen worktop. So instead of wasting your time and money on the company that has no idea what it is doing, invest into the VonShef 13/322 Food Stand Mixer and experience the result of competence and expertise that one might expect only from the professionals of this field. Whether the model from Cooks Professional reflects the company name is up for debate. 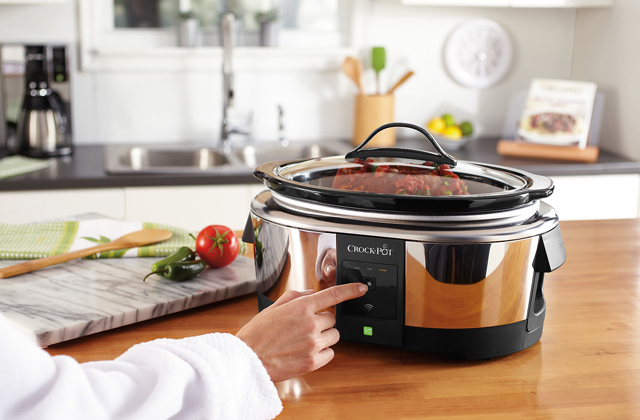 But, after carefully examining what the model has in stores, we wouldn't debate that this is a versatile kitchen appliance that has quite a lot to offer to all kinds of customers. That said, before diving into the model's performance aspects, we would like to talk about its exterior. Now, it isn't a work of modern art, but the silver glossy finish makes the mixer look rather sleek and stylish, and that is more than you can usually say about a kitchen appliance. 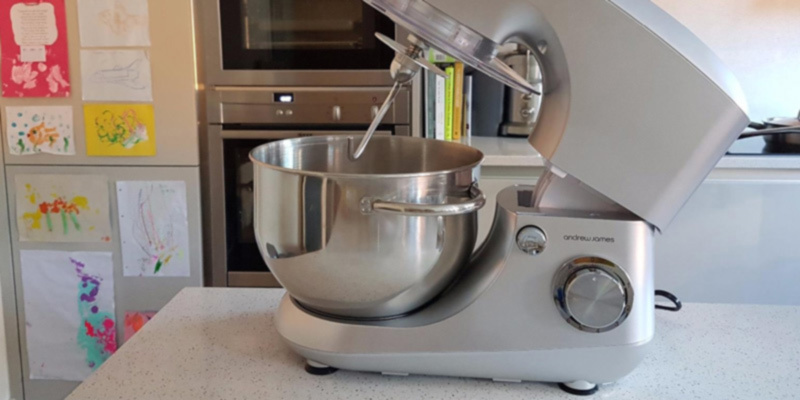 Looks aside, the stand mixer features 37 x 23 x 32 centimetres in overall dimensions and 5.5 kg, the sort of size and weight that doesn't make it particularly large nor heavy, so you shouldn't have any issues carrying it around or finding some space for it. As it usually is the case with these things, the mixer itself is made of plastic while the bowl is comprised of stainless steel, so you won't have to worry about these like rust, corrosion, or any kinds of physical or chemical damage. Of course, the design isn't just about the way a product looks or how much space it takes. It is also about control and the convenience that the design does or doesn't offer. Fortunately, there's not much to worry about here as the people behind this model made sure to make it as user-friendly as possible without sacrificing any of the core elements. One thing that we liked, in particular, is the tilting head of this free standing mixer. With it, you'll be able to easily remove the bowl. On the performance front, the model features an 800W motor. It isn't the most powerful option on the market but it does pack quite a punch. It takes the hard work and stress out of baking, and the large four and a half-litre stainless steel bowl ensures there is plenty of room whether you are making a large loaf of bread or lots of little cupcakes. 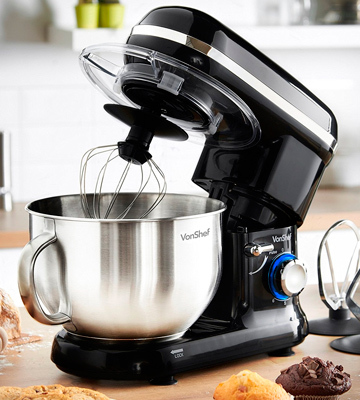 Without inconveniencing the owner, this motor allows the mixer to take the hard work and stress out of the baking equation. Plus, the aforementioned stainless steel bowl with a four and a half-litre capacity means that there will always be enough room whether you are making a large loaf of bread or lots of little cupcakes. Not dissimilar to the majority of these mixers, the product comes equipped with a flat beater, a dough hook, and a whisk. Again, as it usually is the case, the beater is there for dealing with heavy mixtures like cakes, biscuits, and all kinds of pastry. A whisk is more suitable for egg whites and other mixtures that need aerating, while the dough hook is, as you'd imagine, the attachment that is used for bread mixtures. 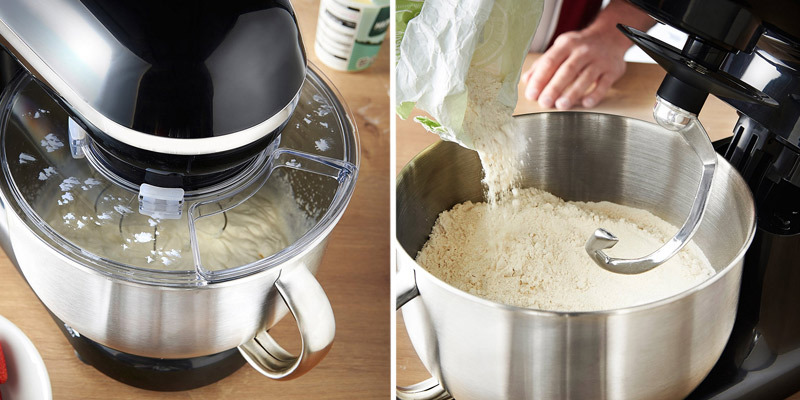 All of these attachments, the standard 6 speed settings, and a pulse function will make mixing, whipping, whisking, and kneading an equally simple and quick task. All things considered, the Cooks Professional D9269 Electric Food Stand Mixer will prove to be a particularly useful kitchen appliance. 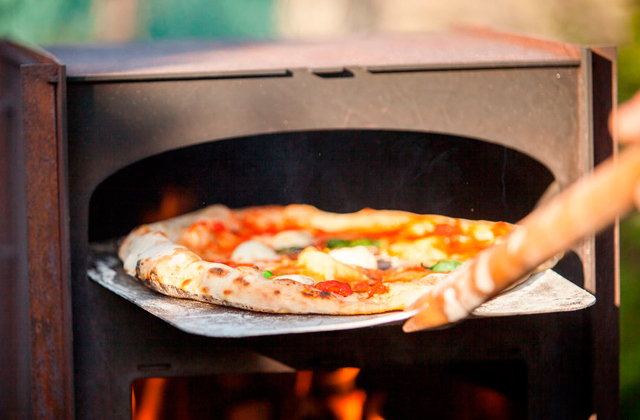 With its help, you will be able to prepare a considerable number of delicious, homemade foods. 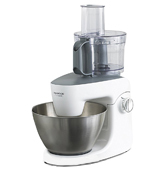 Though quite versatile, the model is particularly suitable when it comes to fluffy meringues, bread dough, and cake mix. When it comes to any kind of device, people generally tend to look for different things. Of course, one of the reasons for that would be the fact that all of us have different preferences and we find some things to be more or less important than other people. As one might expect, stand mixers are no exception to that rule and the customers can be interested in different things when it comes to this kitchen appliance. Some tend to be more interested in performance and are looking for the model with the most powerful motor or the one that has the largest amount of speed settings. All of these things are important when it comes to mixing and should not be ignored when looking for a stand mixer. But other people tend to value convenience above anything else and they're not interested in the model that does not feature a slow-start option or a function that would allow you to quickly burst through the ingredients. Last but not least, some people aren't necessarily looking at the model itself since the majority of them tend to not differ that much and set the highest priority to the size and the material of the bowl since those tend to determine how many batches will it take in order to prepare the meal and how durable the bowl is going to be. And if you're one of those people that aren't necessarily looking for the most powerful model on the market but are instead interested in the one that is going to be handy, convenient and effective, Andrew James Food Stand Mixer is the kind of device you should definitely look out for. Although Andrew James Food Stand Mixer is not necessarily the most powerful kitchen appliance on the market, that doesn't mean it won't be capable of handling the majority of tasks you throw its way. This electric stand mixer boasts an 800W motor, which has an incredible max output of 1400W at the stall. This kind of power makes it a more than a satisfactory baking mixer since it will be able to deal with some of the large mixtures of dough or batter. And if you thought this device is going to trail behind when it comes to speed, you may want to reconcile that opinion. The Andrew James Food Stand Mixer comes equipped with six powerful speed settings that will provide you the opportunity to mix a considerable variety of ingredients with convenience and ease. 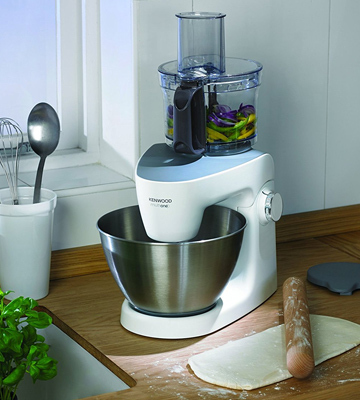 Whether you're kneading dough or whipping cream, the Andrew James Food Stand Mixer will be capable of becoming your perfect kitchen associate. The pulse function that also comes with the device will allow you to blitz through tougher mixes such as bread dough and meringue. 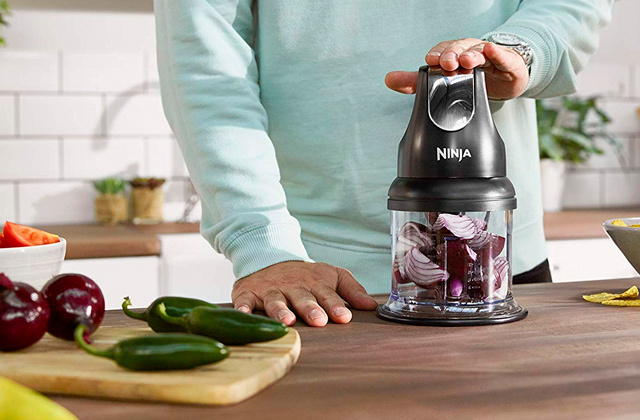 Although this kitchen appliance features some considerable power and speed, those aren't the biggest selling points of this device. One of the more remarkable aspects of this model are definitely going to be its convenience and design. Andrew James Food Stand Mixer comes with a 5.5-litre bowl which is already one of the largest options on the market but it doesn't even plan on stopping there and also includes a splash guard with durable handles, ingredient dispenser, flexible beater (with silicone edge), dough hook, stainless steel beater, whisk, and a handy spatula. The aforementioned splash guard is easy to remove and features an ingredient chute that provides you with an ability to pour extra ingredients into your mixture at the precisely right time, all without stopping the mixer itself. 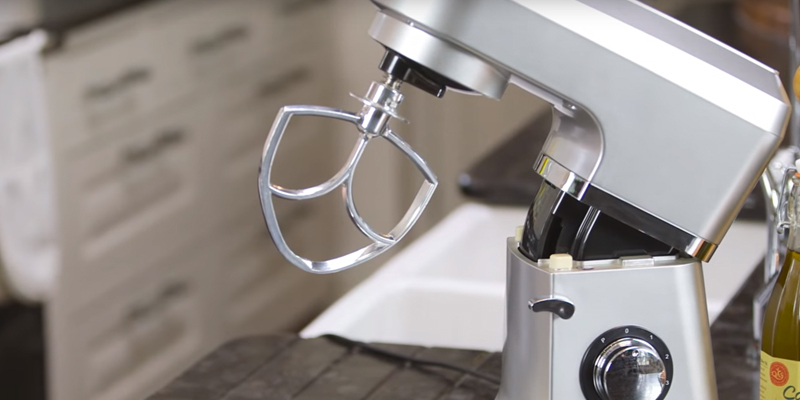 And since their food mixer operates on a tilt head design, the company behind the model decided to incorporate a safety switch to make sure that their customers won't have the option of accidentally lifting the head while it was running. Last but not least, this kitchen appliance comes with a 2-year manufacturer warranty so you can purchase this product without having to worry about it breaking on you after a year thus flushing all of your money down the drain. Andrew James Food Stand Mixer does not trail behind when it comes to power and speed but what makes this appliance such an alluring option is the convenience of use and a comfortable design that ensures operating the device is going to be a piece of cake. We've all been there in our life at one point or the other: you're short of space, you wouldn't describe yourself as an experienced cook, but you would still like to have the opportunity to prepare all kinds of delicious foods without putting in a ton of effort. 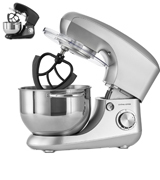 And if you're at that point right now, you simply cannot go wrong with the Kenwood Stand Mixer KM240. 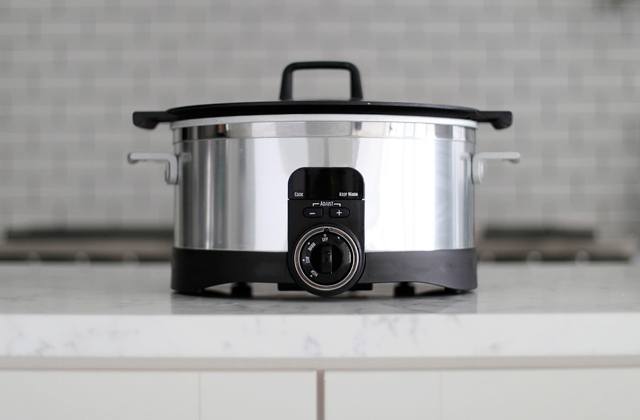 The idea behind this kitchen appliance is quite simple: you get a relatively small and simple device that does the bulk of the job for you. Starting with the small part, the model adds up to 31.3 x 24.3 x 29.2 centimetres in overall dimensions and less than 4 and a half kilograms of weight, so you should be able to find some space for it whether you live in a compact studio apartment or an adequately-sized house with lots of different pieces of cookware. The housing makes the whole thing rather stylish too, though it is prone to scratches, so we would advise caution when operating it. Aside from being moderately stylish and definitely compact, the model's design doesn't come short in the safety department either. Since all of the outlets are fully interlocked, you won't have to worry about a power outage or any other situation that could potentially cause harm to you or your appliance otherwise. When it actually comes to mixing, the model will prove to be a capable piece of cookware equally suitable for small batches and everyday family use. Just like the majority of these appliances, it comes with a flat beater, a dough hook, and a whisk. 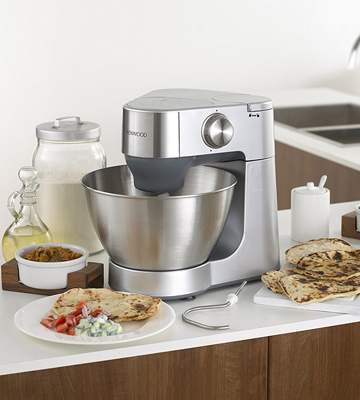 Using the latter, the stand mixer will handle all of your kneading and whisking needs. It will also beat all of the ingredients you need to prepare all kinds of delicious types of bread, cakes, and pastries. And if you don't have any experience with any of that, you can always refer to the relatively comprehensive instruction manual that also comes along with the mixer. As some of you probably know, no mixer is complete without a bowl. In this case, a rather large 4.3-litre bowl made of stainless steel. Thanks to the said volume, the bowl is more than capable of kneading up to 500 grams of bread dough or whisking no less than 8 medium egg whites. Most mixers nowadays utilize a planetary mixing action and this model is no exception to this rule. So it isn't a unique solution but, with it, you'll know for sure that all of your ingredients will always be perfectly mixed without any unstirred pockets. And in case you feel like this machine was designed strictly with inexperienced users in mind, the last element of its design we would like to mention is the variable speed control and a pulse function. Again, they aren't unique to this product but, with their help, you'll be able to have the right amount of control over the process. To rephrase our earlier point, what we have here is a stand mixer that is defined by two of its elements. First, there's the compact design that makes it a great option for people with a limited amount of space. Second, there's the simple and convenient operation that makes the appliance a particularly suitable choice for inexperienced users. Every modern homemaker cannot deny the importance of kitchen appliances and a stand mixer is not an exception. It is made for mixing and whipping the ingredients, therefore you can process dough, make purees from any ingredients, make milkshakes and other delicious dishes. The main advantage of stand mixers comparing to the hand ones is the high motor power that helps achieve a perfect and even mixture, especially when dealing with sticky batter. It also doesn't put any stress on your arms since it stands on a counter and the only thing you're required to do is to press a power button at the right speed. If you adore drinking vitamin cocktails in the mornings, then we strongly advise taking a close look at countertop blenders. 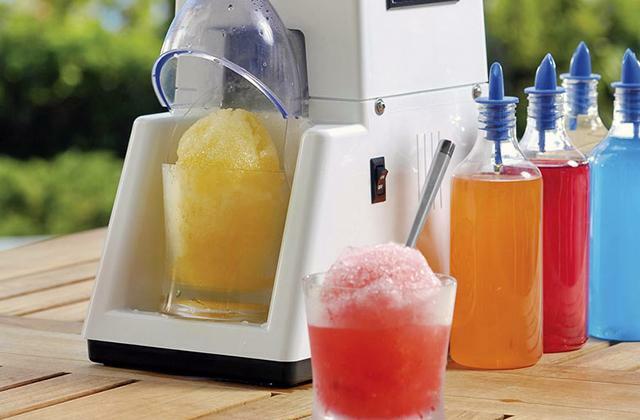 They can process solid and soft ingredients in mere seconds, rewarding you with your favourite drink. A fine motor power allows to process stiff dough or tricky batter properly and quickly. So, if you are likely to make such mixtures, then a high-performance stand mixer is the one for you. The max power of the stand mixer can be up to 1000 watts. Not only high-end machines can process whatever you make them to, but also more humble ones can surprise you with their persistence. The speed settings also determine the time it takes to process the whole mixture. The average stand mixer has 3-5 speed levels and they are used differently depending on the consistency of the ingredients. There are also stand mixers that have 12 speed levels, but such a distinct speed variety is mostly related to the high-end models. And the last but not least thing to consider is the method of mixing. It influences both the speed and the quality, and how even the ingredients are mixed up together. A planetary rotation is considered to be the most effective way of mixing however it usually concerns more expensive models on the market. The nozzles rotate in a certain manner mixing ingredients thoroughly while the bowl is fixed. The rest of the stand mixers typically use a standard way of processing, when the head rotates in one direction only. It often causes discomfort since the ingredients are badly whipped off the walls or small lumps are created. To avoid this effect, some manufacturers make rotated bowls for even mixing. 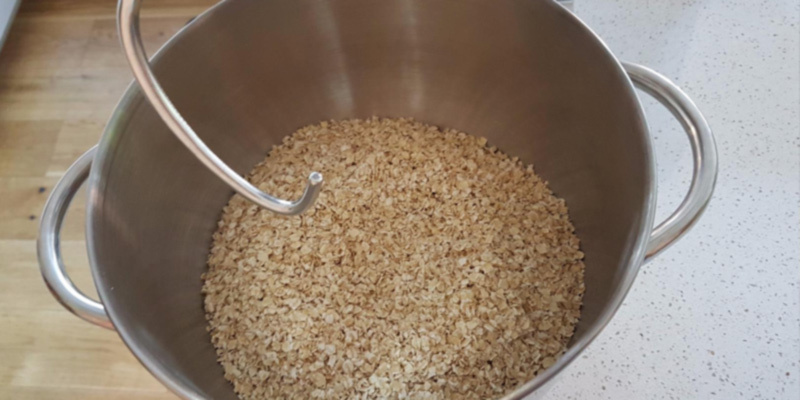 The size and the design of the Bowl also matter, since you will want to know how much batches you can prepare in one row. The bowl can be either plastic or metal, the latter is considered to be the most durable and reliable. The capacity of the bowl should be at least 2-5 liters. However, a number of portions you can process will be a bit less than that. There are also models that have a rotating bowl or a planetary action, which allows to process the ingredients properly and leave nothing behind. With a help of different Attachments that come in the package, you can prepare a variety of recipes. Generally, the set contains beaters (for whipping) and dough hooks (for kneading). The design of all attachments is mostly the same as well as the mode of operation. They only differ in the material they're made of and quality. 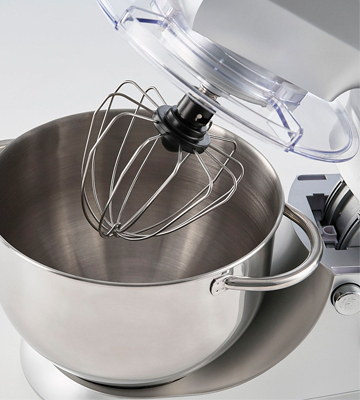 As an addition, stand mixers often have a masher/puree attachment included. And the last but not least thing to consider is the Convenience of the mixer. There are some vital features and functions that stand mixers should possess. For instance, it is great to have such extra feature as a slow-start for preventing the ingredients from splattering all over the counter. Quick burst button may also come in handy when you want to dissolve small lumps in the dough or make even mixtures quickly. 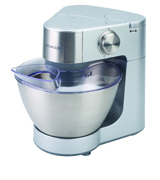 You can detach the bowl and the attachments in common mixers, however, some units can be transformed into hand mixers. You simply need to take off the mixer from the stand and use it for your needs. The steel casing and steel bowl are the most reliable and impact-resistant, therefore you don't have to worry that something may happen to it. Some manufacturers also add features like separate outlets for attachments or pouring shield to protect you from the mess in the kitchen. 1. 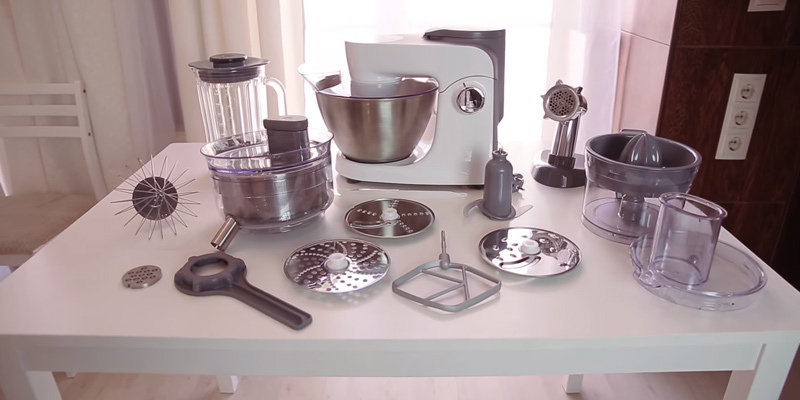 Simone Hill Evolution of the KitchenAid Mixer, The Knot. 2. Cambria Bold 25 Kitchen Items You Can Replace With a Stand Mixer: A Visual Guide, Kitchn. March 6, 2013. 3. Alvin Ward 11 Things You Might Not Know About KitchenAid Mixers, mental_floss. 4. Mixer Recipes, Food Network. 5. Mixer (cooking), Wikipedia. November 6, 2016. 6. 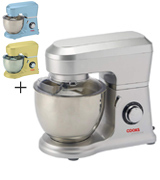 Christina Woodger How to buy the best stand mixer, Which? 7. Kristen Hicks How to Choose the Best Kitchen Mixer [Buyer’s Guide], CompactAppliance. August 13, 2015. 8. Jessie Oleson Moore Get More Out of Your Mixer With These Stand Mixer Recipes, Craftsy. September 11, 2015. 9. Cassie - Best Recipes Team Choosing a stand mixer, Best Recipes.